Would you make a good orderly? Take our career test to find out how you match with this and over 800 other careers. What is the workplace of an Orderly like? An orderly is someone who helps a patient go about his or her daily and scheduled activities in a medical care facility or in a patient’s home. In effect, they help the nurse by handling the more mundane nursing services for them. Orderlies contribute significantly to the healthcare industry even though the care they provide is not medical. The most important function of an orderly is assisting a patient with the various activities of daily living. These are regular day-to-day things that people who are well or still able take for granted. Examples of this are personal hygiene, eating, simple exercises, and other similar activities that some people with medical conditions can no longer do themselves. Their help, reassurance and companionship make a significant difference in the patient experience. Helping or actually moving patients from one place to another is also part of an orderly’s job. There are a variety of methods they do this, depending on the patient’s case. They help transport patients by wheelchair or gurney to the operating room, x-ray department, dining room and other locations around the facility. They can also aid the patient in transferring from bed to wheelchair and vice-versa, if the situation calls for it. Monitoring a patient’s condition is another important task. The patient’s vital signs are important indicators of their overall health; these vital signs include one’s blood pressure, heart rate, temperature, respiratory rate, as well as the body’s oxygen saturation in certain cases. Aside from these, orderlies can also monitor the patient’s food and water intake, the amount and number of times the patient urinates, and so on. Carefully noting and documenting each change accurately can go a long way in helping the doctor provide a solution to the condition or at least mitigate the symptoms being suffered by the patient. They should also know how to follow the right procedures for each situation. This protects not just the patient, but also those looking after them. Because all orderlies are trained in first aid, they can respond to medical emergencies while help is still on the way. They are also trained to prevent certain accidents from occurring so as not to exacerbate the patient’s condition. For instance, an elderly patient is susceptible to falls by virtue of the natural deterioration the body undergoes as one ages. Orderlies are trained to control and cushion the fall so that the patient does not fracture his or her brittle bones. Orderlies also assist in preventing the spread of disease by keeping rooms clean. They are often seen mopping, disinfecting and changing soiled linens. Some also maintain the unit’s inventory of equipment and non-medical supplies. Are you suited to be an orderly? Orderlies have distinct personalities. They tend to be conventional individuals, which means they’re conscientious and conservative. They are logical, efficient, orderly, and organized. Some of them are also realistic, meaning they’re independent, stable, persistent, genuine, practical, and thrifty. Does this sound like you? Take our free career test to find out if becoming an orderly is right for you. Most orderlies work full time. Since inpatient facilities are always open, many work evenings, nights and holidays. 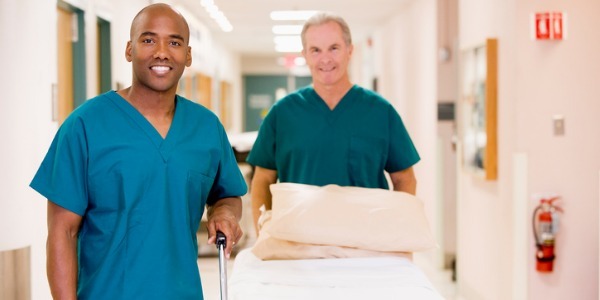 Orderlies spend much of the workday on their feet and the work itself is physically demanding, as they are frequently called on to move, lift or carry patients. Because the job involves exposure to hazardous substances such as blood and bodily fluids, orderlies must follow strict safety precautions and use protective clothing for some tasks.